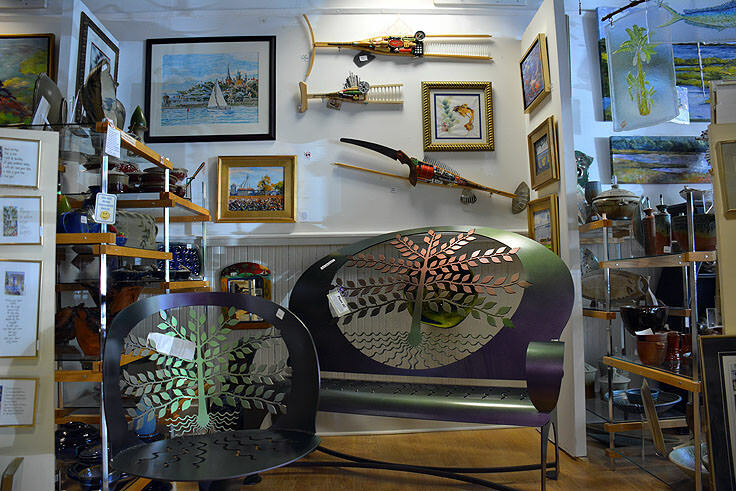 The Carolina Creations gallery is a downtown New Bern legend, and an instrumental contribution to the town's thriving art scene. Founded in 1989 by owners and artists Janet & Michael Francoeur, the gallery features their personalized "Celebration Pottery" works in addition to thousands of inspired and unexpected pieces, contributed by artists from around the state. Over the years, the gallery has won numerous awards, including a spot on "Top 25 American Craft Galleries in the US" list by Niche Magazine, and it's easy to see why. 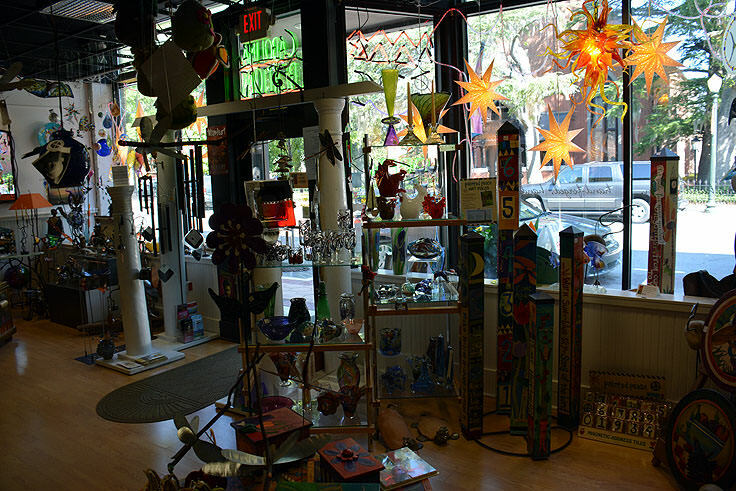 The varied collection of handcrafted pieces in all mediums, accessible to visitors of all budgets, makes buying art easily obtainable by the die-hard art fans, as well as the everyday traveler passing through who wants a little unique piece of New Bern and the Inner Banks to take home. 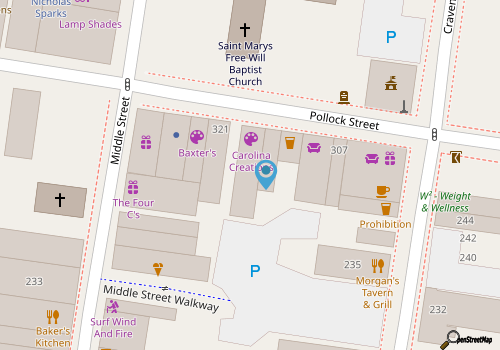 Carolina Creations, with a prime location along Pollock Street and an always inviting store-front window display is hard to miss, but it's the store's expansive interior that always grabs attention. Inside, shoppers and art lovers can browse through hundreds if not thousands of pieces, covering just about every medium in the art world. Lighting fixtures, garden art, clocks, ceramics, furniture, metal works, jewelry, and traditional paintings can all be found here, and as the gallery expands, the artists represented expand as well. The gallery features a rotating assortment of local, regional, and even national works for sale on an everyday basis, and also features a series of special events that are open to regular patrons and new visitors alike. Most prevalent, the gallery is the home base for monthly or bi-monthly "art walks," a showcase of artists and pieces on display that also feature special sales, charity drives, and fun treats and demonstrations that art patrons of all ages can enjoy. 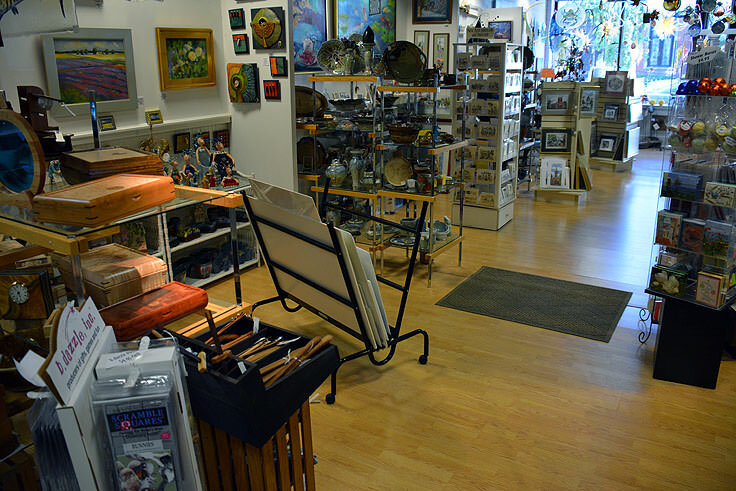 The gallery also features regular "sales" for art acquisitions on a budget, in addition to local gifts and souvenirs, ensuring every shopper will find a treasured piece of New Bern memorabilia to take home. With a prime location in the heart of New Bern's shopping scene, and an assortment of award winning treasures, Carolina Creations is a must stop for both art lovers and anyone who wants a detailed, insider's view into the local and regional art world.